Other. That sort of sums up how I’ve felt for a long time as a woman who is a raging nerd, geek, insert your favourite term here. I’ve always felt like I had to justify liking things like sci-fi and fantasy, and being able to hold a conversation with someone about these things, but past my early teens and Archie comics, I never felt the need to pick up a comic and read one. As far as I knew, and She Makes Comics points out, women weren’t welcomed in the medium at one point. But, I had things all wrong, and here’s where things get surprising, because the documentary points out that it wasn’t always like this. 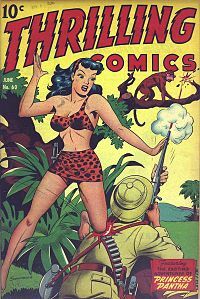 At one stage, more women read — love, detective, adventure – comics than men did. Let that sink in. In an industry that is renowned for the way they treated female characters – raped, killed and so forth – women were once their major audience. It’s still blowing my mind, as does the rest of the journey She Makes Comics takes viewers. 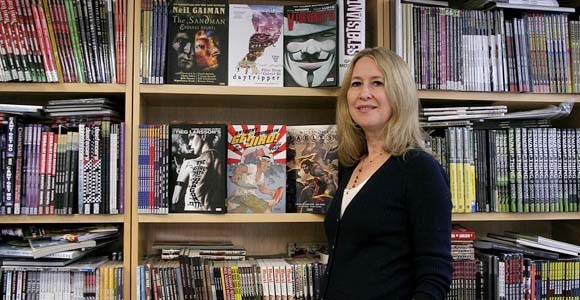 Director Marisa Stotter traces comics from the early days of women readers, artists and writers to the emergence of the Comic Code and the rise of the superhero comic that changed female characters in comics to damsels in distress, and less capable than they were years before. Cue women’s lib, and readership dwindled more as female readers didn’t want to read things that told them they needed a man to be complete. As one of the interviews points out, why would any company want to alienate an audience who wants to spend money on comics? 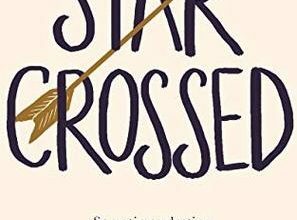 Through in-depth interviews with a diverse cast of female writers, artists and historians, her story further details the early years of fabulous female creators to Underground Comics and contemporary fan culture at cons. 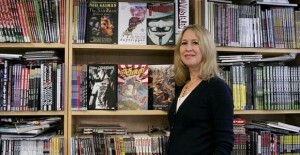 Her interviewees are a host of women who have worked behind the scenes in the industry for decades now, like Trina Robbins, Joyce Farmer, Wendy Pini, Gail Simone, Jenette Kahn, Louise Simonson, Ann Nocenti and Karen Burger to name but a few. These women have brought about change and nurtured other writers and artists along the way. The wealth of history is remarkable as is the insight into how the industry once worked and how it’s changed. Watching this as a fan, just starting to enjoy and appreciate the medium, I found myself thoroughly surprised at the history this documentary reveals. Comics have always been something remote, and never aimed at me as an audience. 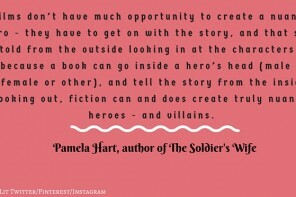 But, watching these women – and men – talk about the contributions of women to the comics, is an eye-opener, especially in an era of how women are treated in superhero movies, TV and videogames are taking centre stage. What was most mesmerising though, was watching these women talk with such an intense passion for comics. How can anyone doubt their passion, integrity and love for this medium I’ll never understand. More importantly, how many women are out there with that same passion, but have never thought to enter the industry because of its reputation towards female creatives? As the documentary points out there are parts of the industry who want female creatives, but the industry’s reputation precedes them, I guess, and these female writers and artists just don’t apply for these positions. It’s a scary thought at what the industry has lost with such a narrow-minded focus (and in some cases, that narrow-mindedness is still costing them) and what it could have been had it always remained an inclusive medium. As a fan, this is a thoughtful and welcomed documentary. It tells me that the industry is capable of so much more, and perhaps, it might actually get there some day. 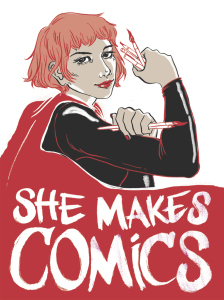 She Makes Comics is now available to order on DVD and as a digital download at SheMakesComics.com. The movie ships on December 9, and all U.S. orders placed by December 16 will be shipped in time for the holidays. Next articleTerminator: Genisys: why is it getting such a bad rep?